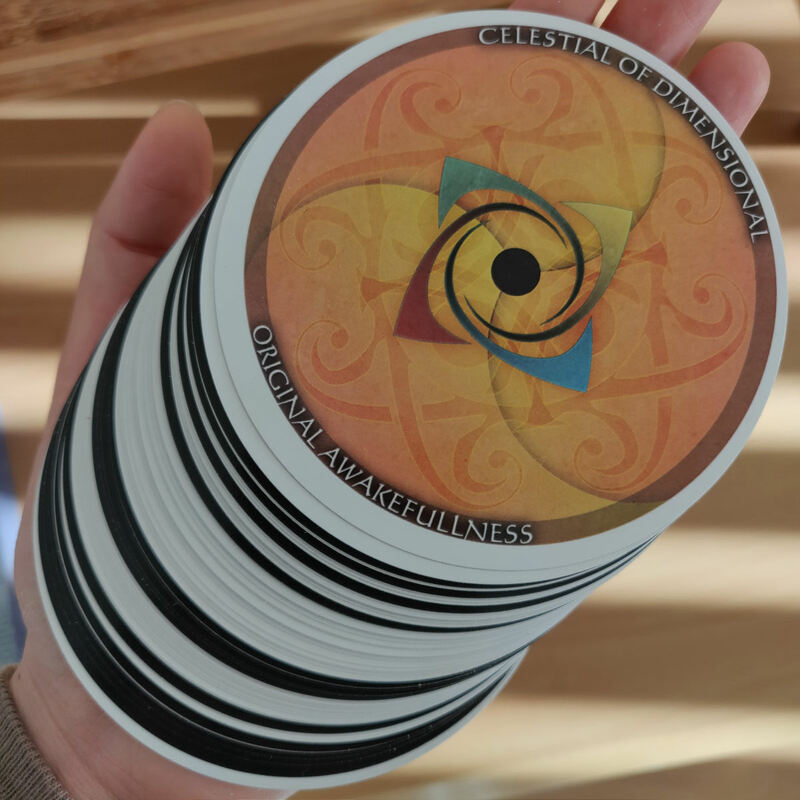 Wild Harmonic oracle cards from the genius of Gabriel Marihugh wow-ed me the first millisecond I saw it when Carrie Paris shared images of the deck. To my great fortune, Marihugh then reached out to me and asked if I’d like to review the deck. Heck yeah! My only gripe with the deck– which isn’t even Marihugh’s fault– is it being published through GameCrafter. It’s probably not a big secret that I’m no fan of GameCrafter produced decks. I appreciate that it’s the most budget-friendly way to publish a tarot deck for creators, but… sigh. The dreamer in me keeps wishing for a better alternative to come along for creators who want to go the route of print-on-demand. Anyway, now that I’ve got that out of the way, we can focus on the deck. This deck seems to be like a deck that U.S. Games or Llewellyn would certainly pick up and mass-publish. It’s got wide appeal, is really well done, and Marihugh has produced a wealth of written content to go along with the cards. 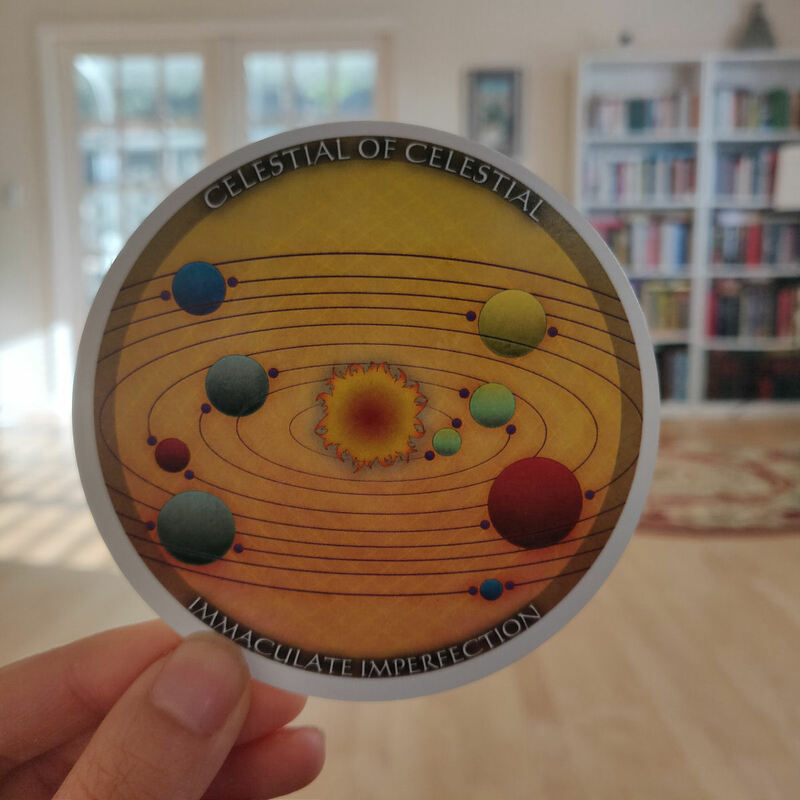 It’s an oracle deck system that has been brilliantly thought through and captures the adoration of beginner oracle card readers and seasoned practitioners alike. It awakens. That’s what it does. Working with Wild Harmonic awakens something in you that you didn’t know was sleeping before. It’s great for inner reflection. It works as a supplement to tarot readings. It works in standalone oracle card readings. The colors are vibrant. The art is impeccably finished. Though the cards themselves only come with a fold-out booklet no more than a few pages, check out Marihugh’s website. There is a ton of information about every single card in great detail. The deck’s premise and system design is explained fully. I’m presuming all of that isn’t printed into a physical copy guidebook for budget reasons. If this deck were to get picked up by a traditional publisher, then there’s a complete deck set here that Marihugh has already produced. I love the simplicity of the card backs. However, I confess I do waver back and forth between liking the simplicity and also griping that it’s too simple. The blank white space and gray lines may feel a bit too simple in stark comparison to the vibrant colors of the card faces. The size is perfect, by the way, I love how it’s travel-friendly, can fit into a discrete velveteen drawstring bag, and I can take it on the go with me anywhere. Plus, if I ever need help interpreting a card, the deck creator has generously provided card entries free online. So it’s easy to access any time I want via my smartphone. I can do readings with this deck anywhere I want! Which immediately appeals to me: it’s easy to travel with. As if in tribute to the structure of the tarot deck, Wild Harmonic consists of two sub-decks and then a a Joker card (Presence of Absence). 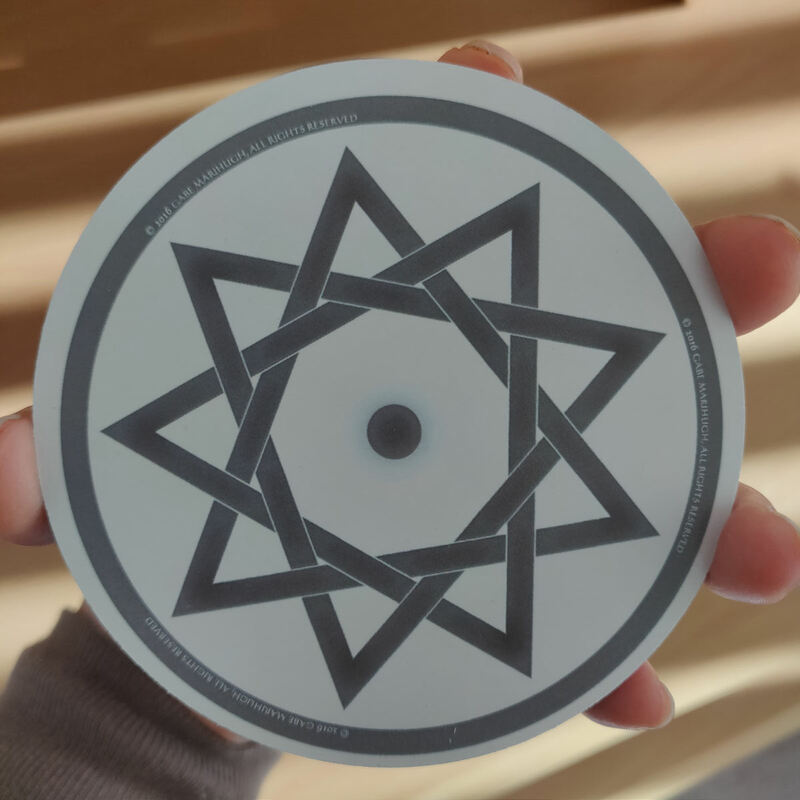 It’s got an Elemental Deck, which is marked by the white borders, and a Shadow Deck, marked by the black borders. Read all about the structure on the Wild Harmonic website. 49 of the cards are Elementals. 15 of them are Shadows. 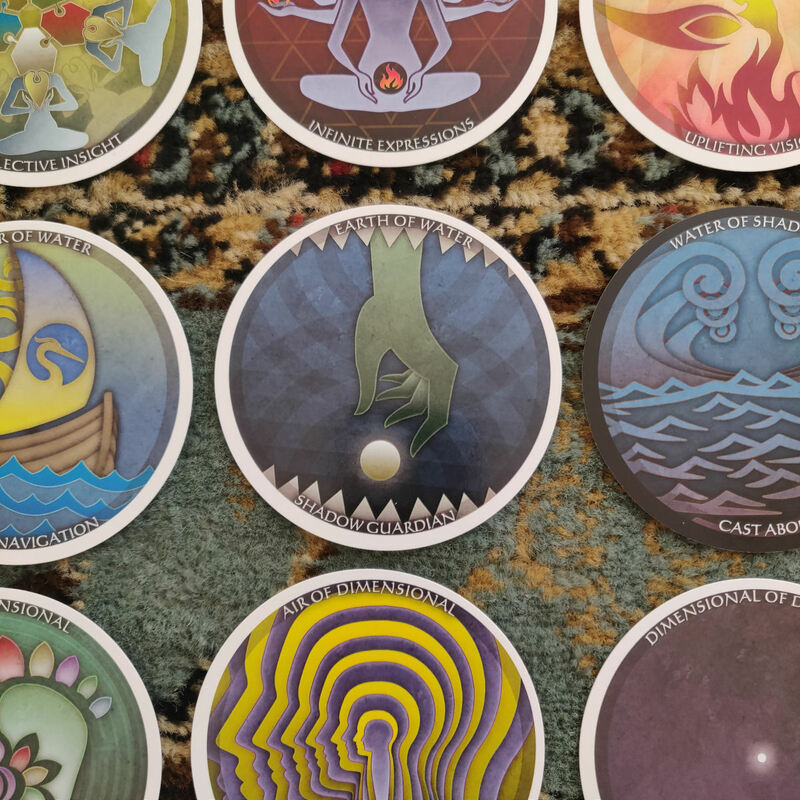 The deck creator designed these cards so that they could be used for chakra healing or chakra work. The cards can be used to spiritually diagnose issues that may be weakening any of the seven main chakras along the central meridian. 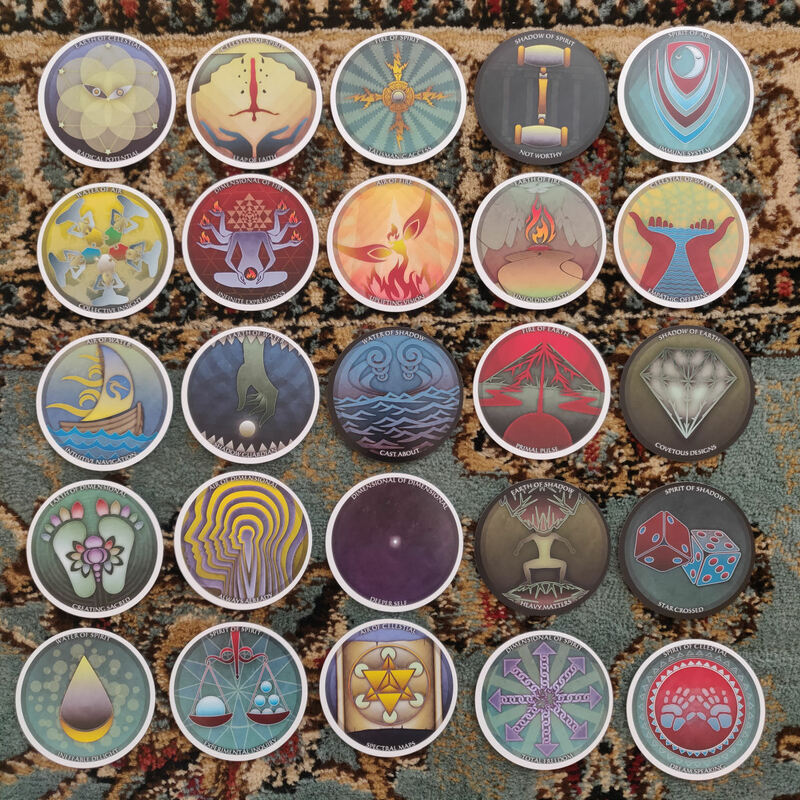 You can also select one of the cards and use it to tune up one of your chakras. The 15 Shadow cards can also be separated out and used in guided shadow work, where the cards serve as prompts. 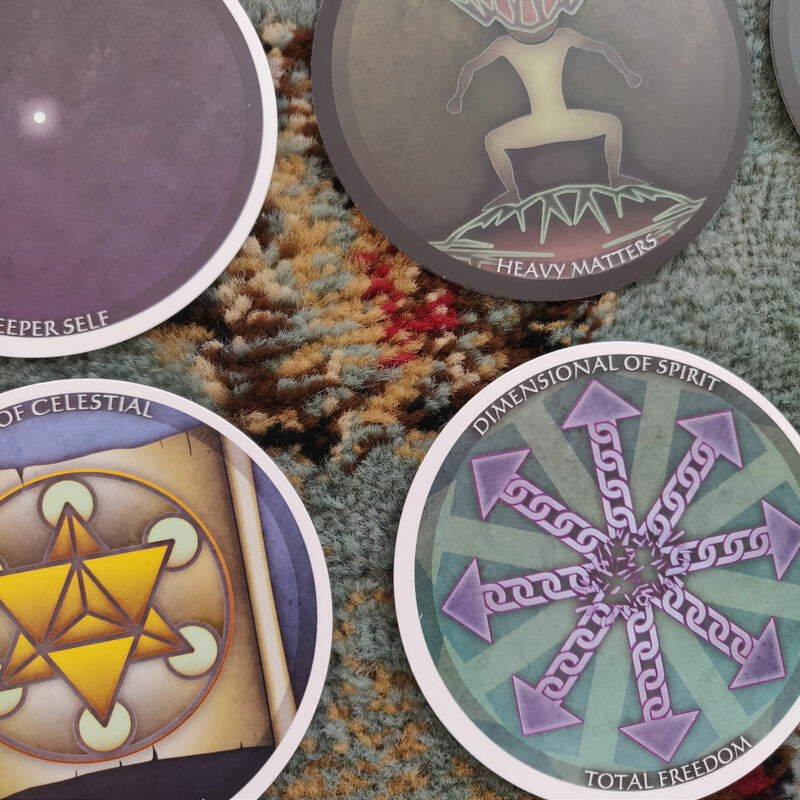 The card entries that Marihugh provides and even the question prompts in the companion foldout booklet includes questions assigned to each Shadow card that helps facilitate you asking yourself hard questions. You can also use it in shamanic journeying or pathworking, again separating out either just the Elementals to reach higher vibrational states or just the Shadows to move down into lower vibrational states. In a rather humble, unpretentious way, Wild Harmonic is kind of brilliant. It doesn’t try to be brilliant. It just is. 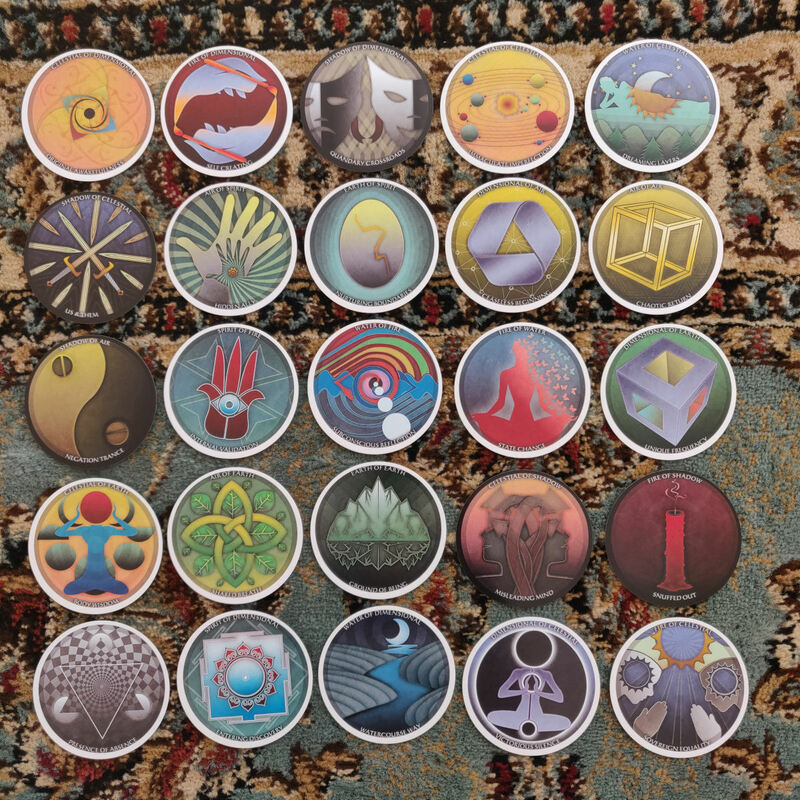 Anyone remember a 90s game called Pogs? 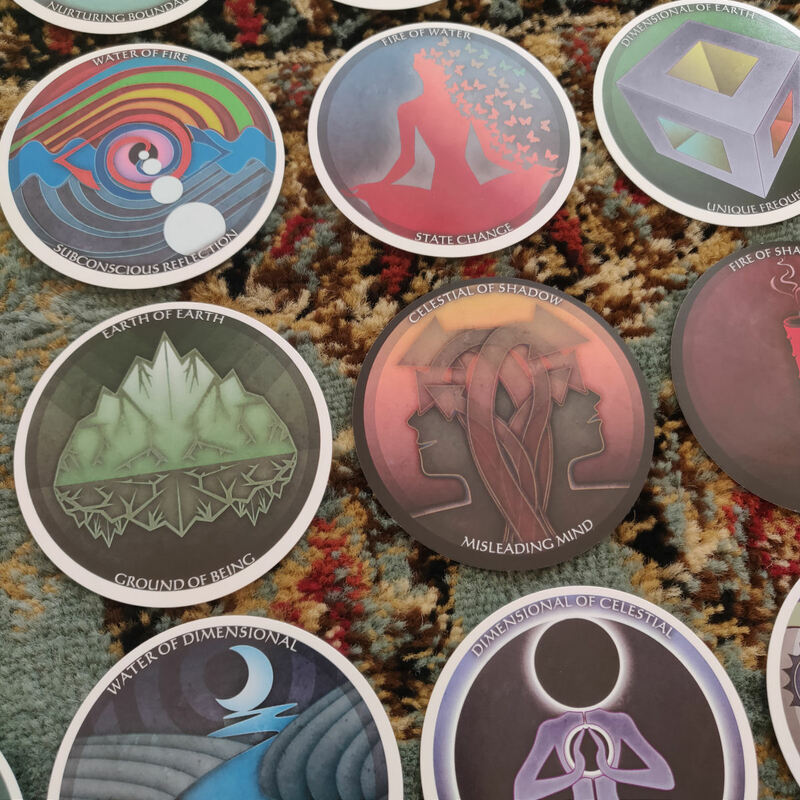 Back then we collected these beautiful, full-color milk-caps and these oracle cards kind of remind me of them– like an esoteric version of pogs. Anyway. 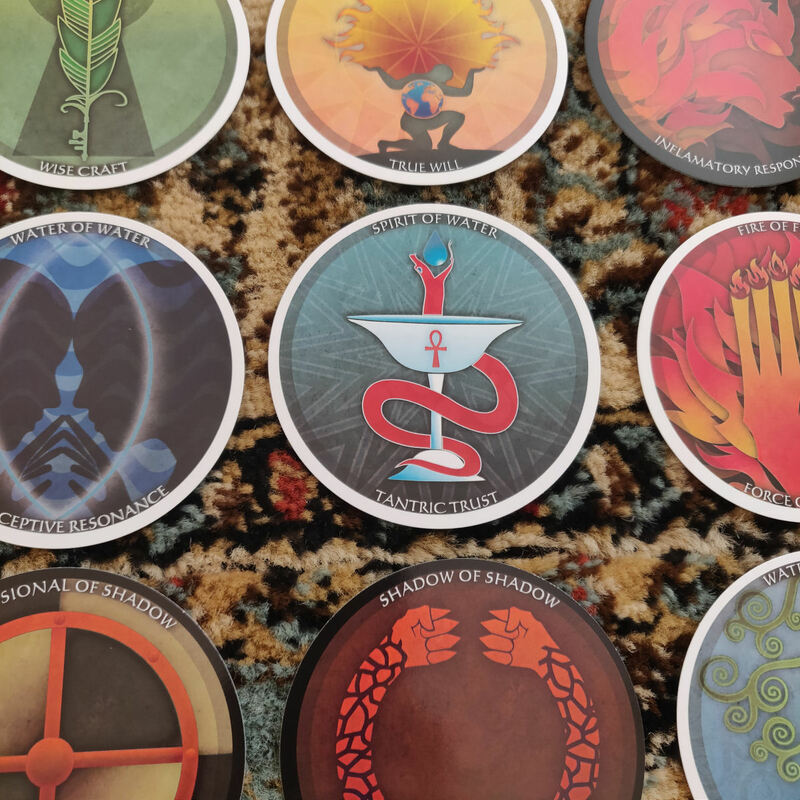 The system and underpinning philosophy of the deck is impressive, and if these cards are calling your name, you are going to get a lot of incredible mileage out of studying the system more intensely. They were also spot-on, which is important. The little deck is unexpectedly powerful. The more I work with it, the more I want to work with it. 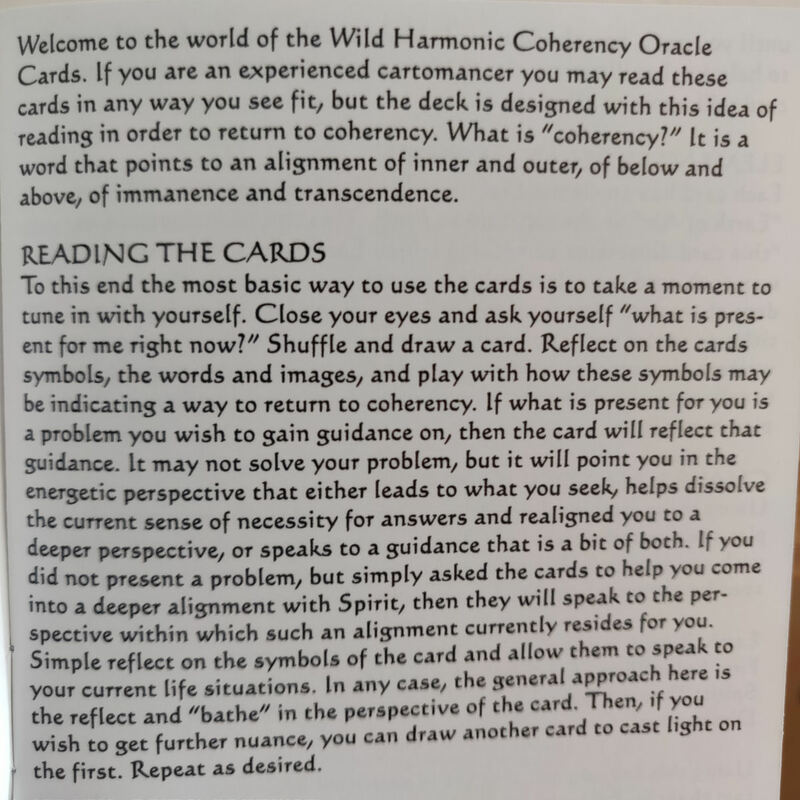 I had pulled the above card in a personal reading, and that card inspired the design of the following spread, which has now become my go-to card spread for reading with the Wild Harmonic. 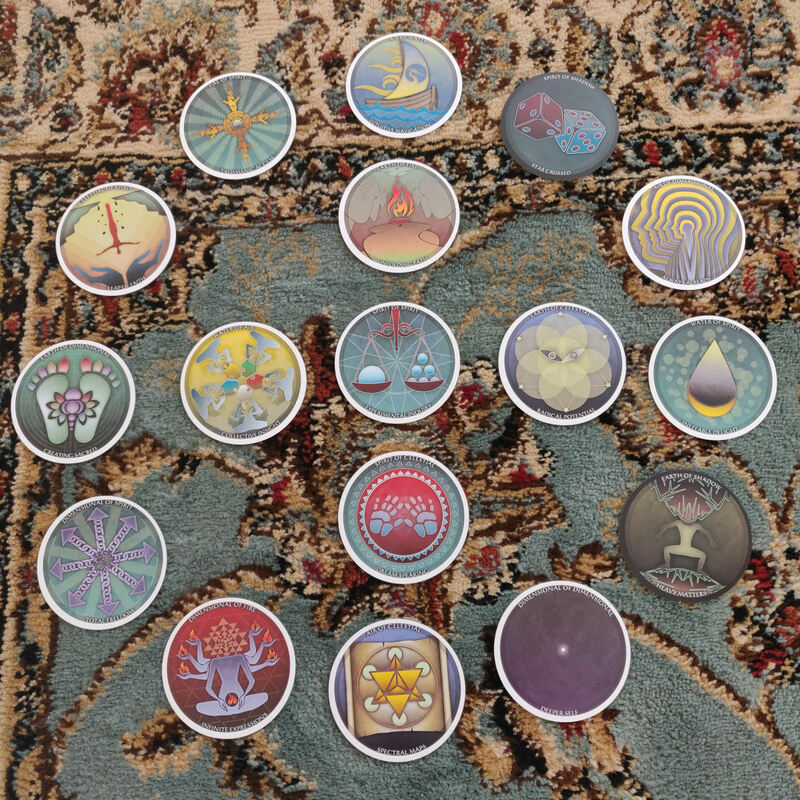 It consists of 12 cards drawn into a circle following the 12 houses of the astrological wheel, and thus read through the correspondences of the 12 astrological houses. Then at the center, I have a 5-card cross spread, again following the elemental corners per the wheel, i.e., left is Fire for Aries; bottom is Water for Cancer; right is Air for Libra; and top is Earth for Capricorn. Then the Fire positioned card is read for career matters and the physical plane. Water is love and relationships, family, the interpersonal. Air is communications, social matters, community or civic matters, and engagements with community. Earth is money matters or business. 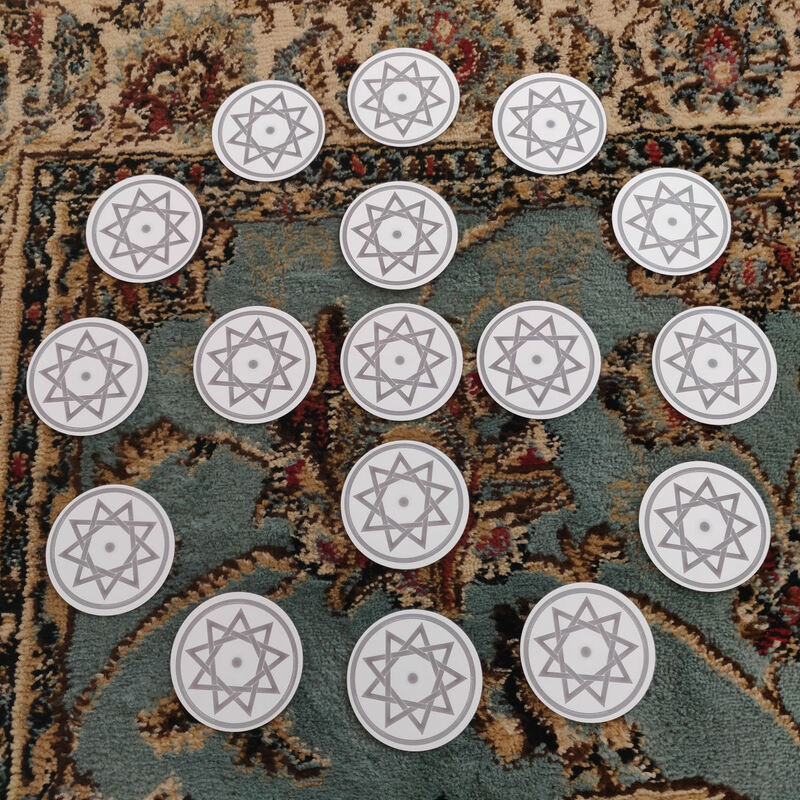 Then the center card is Spirit: it’s the final oracular message– and focal point that Spirit wants me to pay attention to– from the Guides, or the core message from your higher self. Please feel free to use, modify, publish, copy, re-post, share, do whatever with the card spread idea. I never feel any sense of ownership over card spreads. So treat the spread as public domain and totally free for you to use in any way. 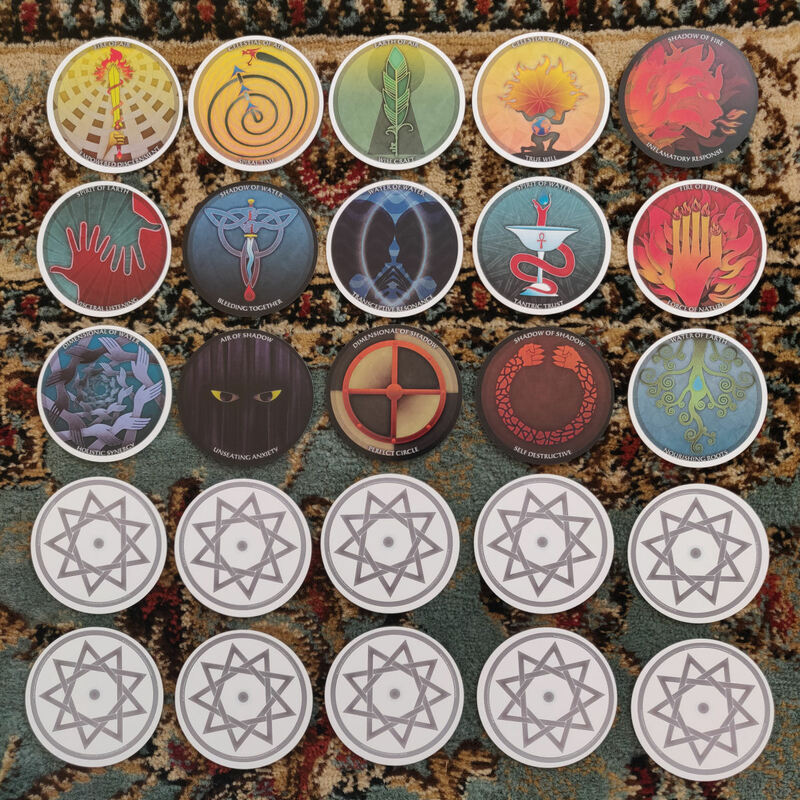 I will say that with standard tarot or oracle decks, which are rectangular, this spread can get clunky and you’re going to need to find a whole lot of flat surface area to lay out the cards. Whereas with Wild Harmonic, it becomes a very easy spread to work with. 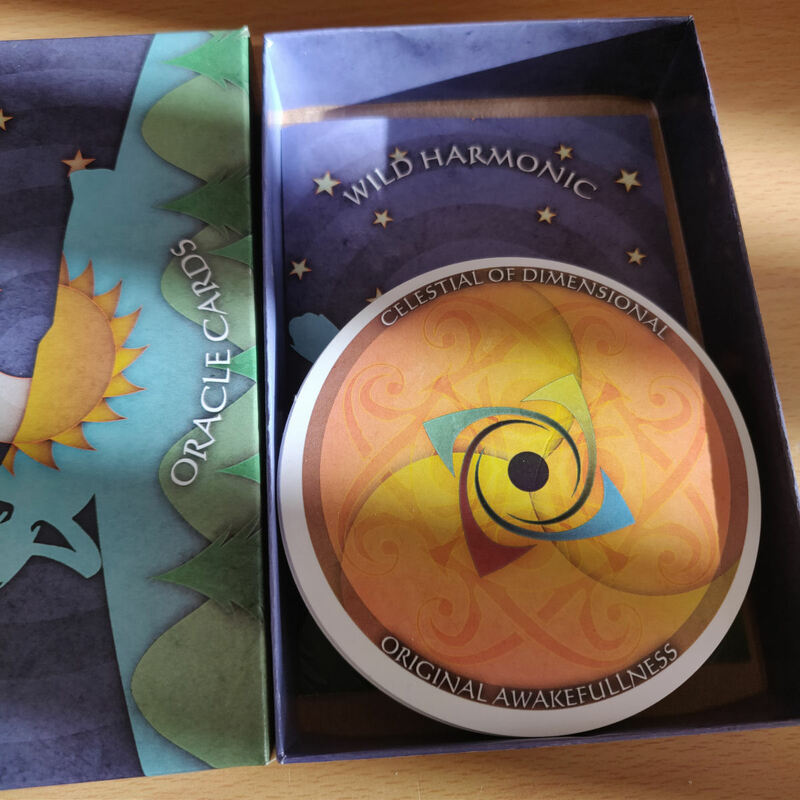 The Wild Harmonic Oracle Cards are going to speak to the professional mystic. It’s going to amplify your readings with clientele. 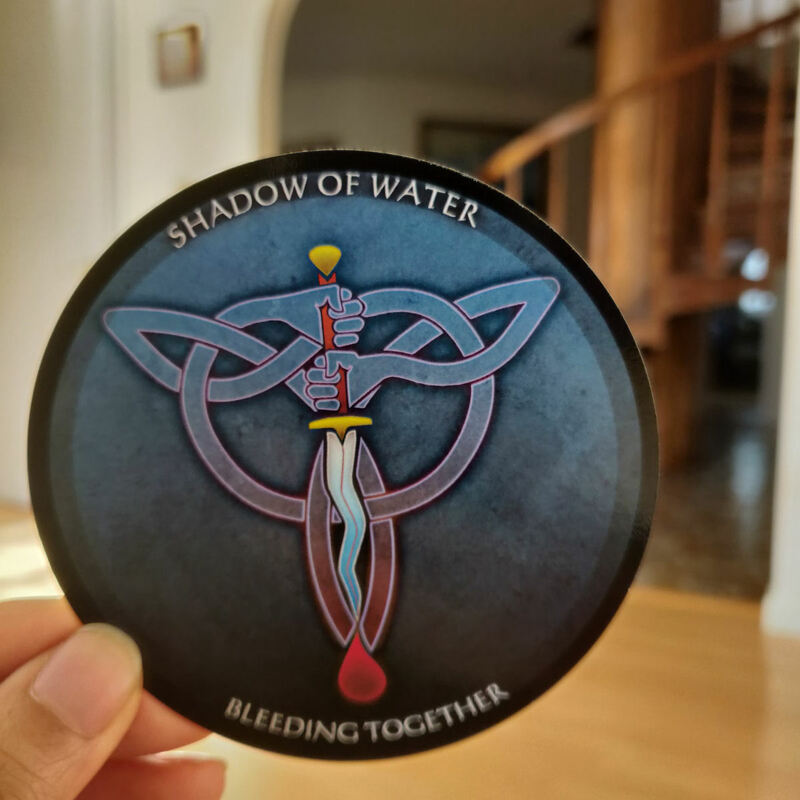 As a standalone oracle, they’re great for personal shadow work, shamanic journeying, taking the deck with you into the woods and working with them and the spirits there, and also esoteric study, as Marihugh’s website is just filled with incredible information and resources. 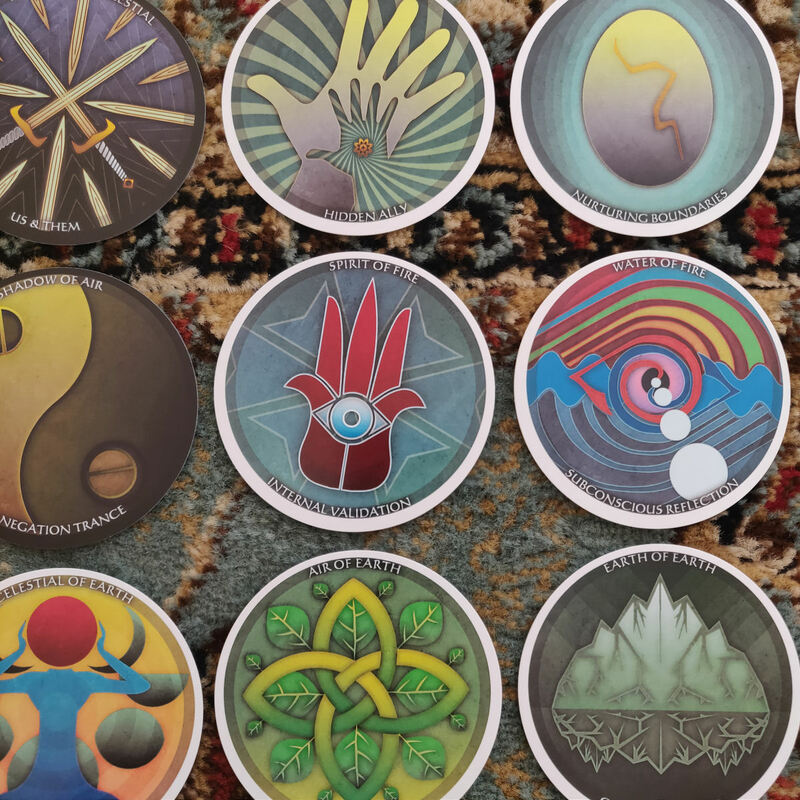 As a supplement to another divinatory system, such as tarot, or even the I Ching, an astrology natal or transits reading, etc., these cards will take your work to the next level, seriously. 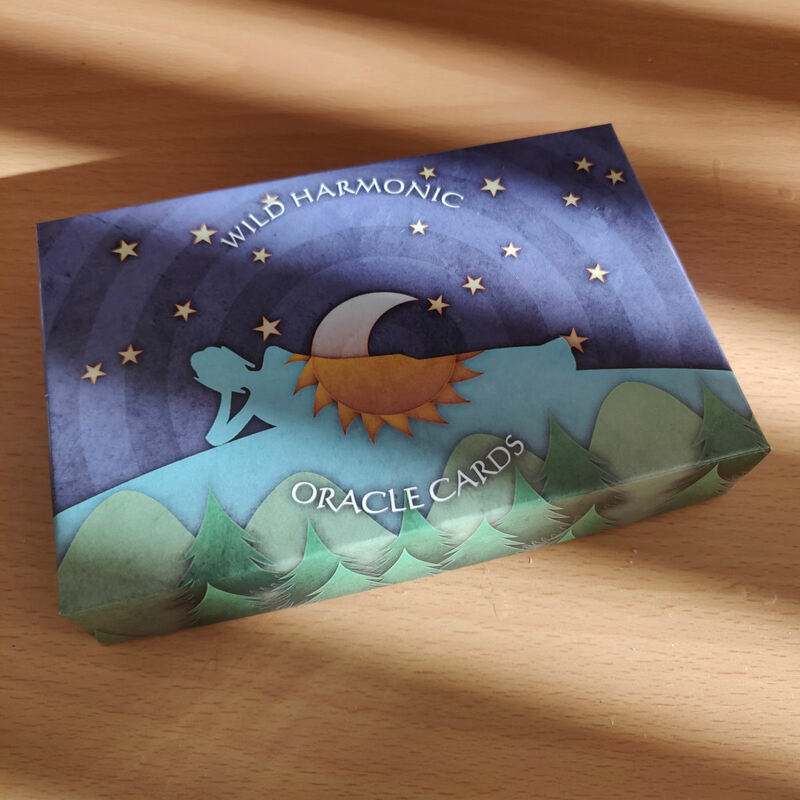 FTC Disclosure: In accordance with Title 16 of the U.S. Code of Federal Regulations Part 255, “Guides Concerning Use of Endorsements and Testimonials in Advertising,” I received The Wild Harmonic Oracle Cards from the deck creator for prospective review. Everything I’ve said here is sincere and accurately reflects my opinion of the deck. I love the fact the cards are round! Great artwork too, thanks for reviewing! This looks beautiful and very inventive. Thanks for the review.